PET/CT provides the fusion of two powerful diagnostic imaging techniques in one machine. Positron Emission Tomography (PET) is an advanced molecular imaging procedure that provides a way to diagnose disease through the measurement of metabolic activity. 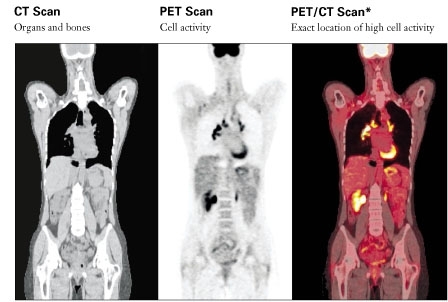 PET is a functional imaging technique: the images are derived from the metabolism of radiopharmaceuticals absorbed by the tissue under study. Computed Tomography (CT) is an X-Ray method producing cross sectional imaging as well as other views of a patient’s anatomy. Using the two methods simultaneously allows for higher accuracy in image presentation. PET/CT complements all other imaging modalities including routine X-ray, Ultrasound, MRI, and conventional CT; however PET/CT can often detect pathology before it becomes visible with conventional imaging modalities because metabolic changes usually precede anatomic ones. PET/CT is a nuclear medicine procedure. The patient is injected with a radiopharmaceutical which concentrates at the site of metabolic activity. A sophisticated detector images the distribution of the radiopharmaceutical in the body, thus imaging tissue function. PET can detect the spread of malignant tumors and differentiate cancerous tissue from benign tumors and scar tissue. When coupled with simultaneous CT providing high quality anatomic landmarks the PET/CT provides increased diagnostic accuracy. This can have a dramatic impact on patient diagnosis, treatment, and response to therapy, patient care planning and care. Radiopharmaceuticals based on positron emitting isotopes, such as Fluorodeoxyglucose, become signal-emitting tracers when injected into the patient. For a PET/CT scan, patients are first injected with a radiopharmaceutical, usually FDG, a radioactive glucose compound. After the isotope uptake time, the patient is imaged on the CT portion of the PET/CT system creating the landmark images. With the isotope compounds distributed throughout the body and processed by the organ being targeted for imaging, the patient transits into the pet portion of the scanner and the PET scanner detects the FDG accumulated in glucose-avid organs or tissues and creates images. The signals detected by both PET and CT are processed by a computer to create fused images. The distribution of metabolic activity discretely landmarked by the CT anatomic images are presented as a set of tomographic slices. Because cancer cells usually have a higher metabolic rate than surrounding cells, they absorb more of the tracer and will show up more prominently on the image. PET/CT enables physicians to better determine the presence of a tumor, as well as the extent and spread of disease. 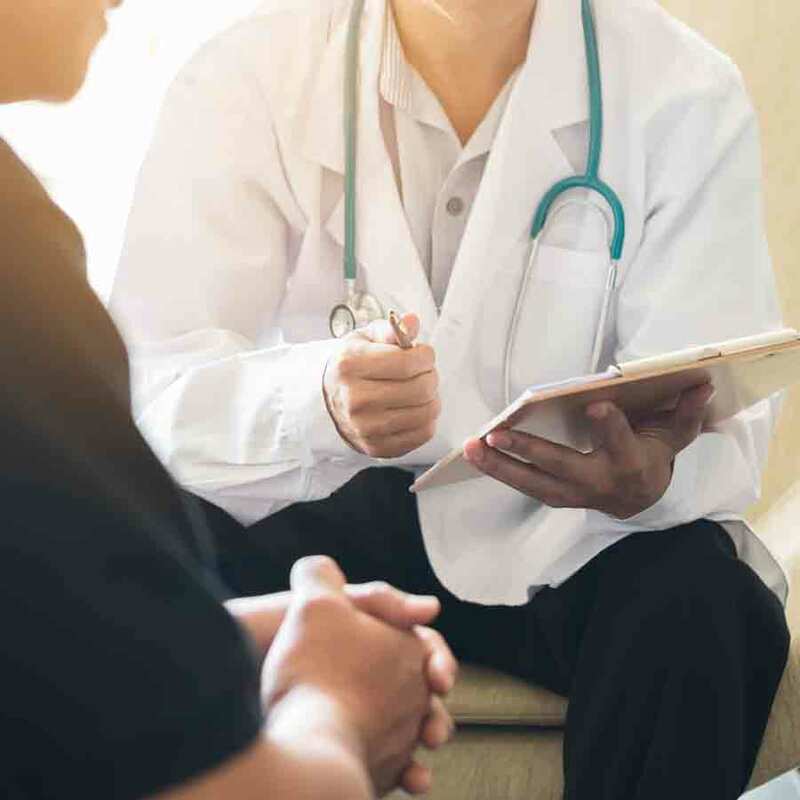 With better information about the early presence or spread of cancer, physicians can select the treatment approach that’s most effective for the patient. An important benefit of PET/CT is its high-definition anatomically specific imaging which can detect tissue abnormalities even in the absence of structural changes. The detection of small amounts of malignant tissue, often undetectable by conventional imaging techniques, can have a major impact on the choice of treatment for patients, which may involve drug therapy, surgery, radiation, chemotherapy or a combination of all available options. PET/CT is considered particularly effective in identifying whether or not cancers are responding to treatment, if a person is cancer free, or if a cancer has recurred—and where. Staging of Cancer: PET/CT is extremely sensitive in determining the full extent of disease, especially in the cancers noted above. Confirmation of metastatic disease allows the physician and patient to more accurately decide on how to proceed with the patient’s management. Checking for recurrences: PET/CT is currently considered to be the most accurate diagnostic procedure to differentiate tumor recurrences from radiation necrosis or post-surgical changes. Such an approach allows for the development of a more rational treatment plan for the patient. Assessing the Effectiveness of Chemotherapy: The level of tumor metabolism is compared on PET/CT scans taken before and after a chemotherapy cycle. A successful response seen on a PET/CT scan frequently precedes alterations in anatomy and is considered to be an earlier indicator of tumor shrinkage than might be seen with other diagnostic modalities. Early Detection: Since PET/CT images biochemical activity, PET/CT can accurately characterize a tumor as benign or malignant, thereby avoiding surgical biopsy when the PET/CT scan is negative. Conversely, since a PET/CT scan images the entire body, confirmation of non-local metastasis can alter treatment plans in certain cases from surgical intervention to chemotherapy. Epilepsy: PET/CT has helped advance the diagnosis of refractory epilepsy leading to cures in certain cases. PET/CT is one of the most accurate methods available to localize the areas of the brain causing epileptic seizures and to determine if surgery is a viable treatment option. 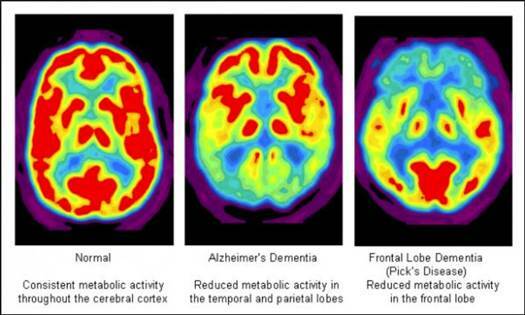 Dementia: The brain is highly dependent on glucose metabolism. PET/CT can reveal abnormal patterns of uptake in the brain and is, therefore, a valuable tool for assessing patients with various forms of dementia. It is particularly useful in diagnosing Alzheimer’s disease and in distinguishing Alzheimer’s disease from other dementia disorders, such as vascular dementia, Parkinson’s disease, Pick’s disease and Huntington’s disease. Alzheimer’s Disease: Although the only definitive test for Alzheimer’s disease (AD) is autopsy, PET/CT can supply important diagnostic information. When comparing a normal brain vs. an AD-affected brain on a PET/CT scan, a distinctive image appears in the AD-affected brain. This pattern may be seen very early in the course of Alzheimer’s disease, when other imaging is normal. The confirmation of AD is a long process of elimination that averages between two and three years of diagnostic and cognitive testing. PET/CT can help to shorten this process by identifying distinctive patterns earlier in the course of the disease. Since currently available medical treatments seem to be more effective if started early, a correct and early diagnosis may have important patient ramifications. 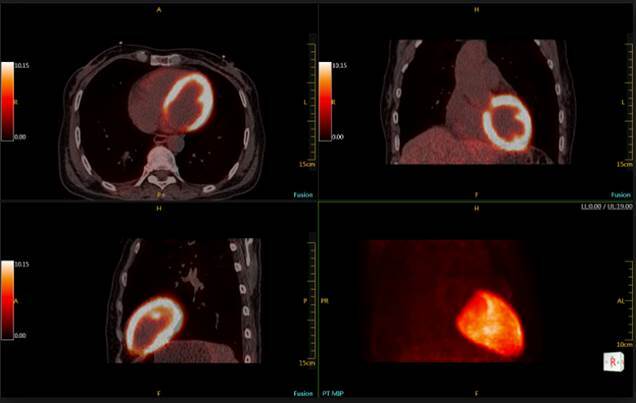 PET/CT has a number of important uses in cardiology. PET/CT can be particularly helpful in the diagnosis of CAD if conventional perfusion (nuclear cardiac stress test) or echocardiographic stress tests are equivocal. Myocardial viability offers the most important role for PET/CT in cardiology. PET/CT flow/metabolism studies are generally regarded as the “gold standard” in identifying hibernating myocardium, a critical element in determining successful functional recovery after revascularization. PET/CT and CT or MRI? PET/CT measures metabolism, unlike MR or CT, which “see” structure. It therefore complements these modalities, as it can often detect an active tumor before it can be seen on MR or CT. PET/CT can also often differentiate malignant from non-malignant masses such as scar tissue formed from surgery or radiation therapy. PET/CT is often used in conjunction with an MR through “fusion” to provide a full three-dimensional view of an organ and the location of cancer within that organ, by superimposing the functional and structural information for PET onto CT or MR. Many private insurance companies and Medicare reimburse for PET/CT scans. Click here for the current CMS PET/CT covered indications. For the most accurate information, please contact your patient’s insurance carrier directly. on whether the whole body, or a particular part of the body is scanned. All previous studies, including CT and/or MR films and reports. Any prior PET or PET/CT images and reports if one was performed at some other time or site. Patients should not eat or drink (other than water) 6 hours prior to the exam. Patients are encouraged to drink plenty of water prior to the exam. Patients should refrain from strenuous exercise for 1 day prior to the exam.